Protective gloves for safe use. One of the most important safety tools for sandblasters. Furthermore the cleaned work piece can be moved safely in cabin while working. 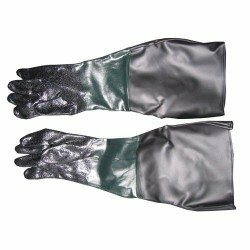 Depending on use, with time, all protective gloves wear out. We take care about safe use of our sandblasters, change the wearing parts in time!